The fact is that every day, regardless of age, we Americans are getting more confused. And the truth is, we owe a great part of that state of confusion to one former reality show TV host who has totally altered the reality of what we thought in this country were strong public institutions, constants we could count on in a troubled and confusing world. The FBI was one of those institutions. When I was a kid, the FBI was considered to be the model for probity, while the Kremlin and its KGB were not. J. Edgar Hoover’s G-Men were the good guys; the Russians certainly weren’t. Think of Boris and Natasha and those weathered, tough-looking guys you saw every year watching the big May Day Parade atop Lenin’s tomb in Red Square. Those were the really bad guys. In fact, in the spirit of those times, my oldest brother became an FBI special agent, sworn to uphold the law and constitution, and spent a career bringing lawbreakers to justice and otherwise keeping us safe. As an FBI agent, he and his colleagues in the Bureau viewed the KGB and other Russian intelligence agencies as this country’s sworn enemies. That’s why Hoover, the sworn enemy of godless communism and state socialism, liked to hire agents whose backgrounds seemed the model of conservative American values. In that Cold War world, the FBI, Hoover and his Republican Party were institutions that reflected Middle American values, while another organization, the National Rifle Association (NRA), as its name implies, was a conservative organization which mostly represented hunters, not weapons manufacturers. But in today’s world, Wayne LaPierre, the long-time leader of the NRA, which gave the Trump campaign at least $30 million last year, attacks the FBI as a corrupt organization. Never mind that LaPierre’s own organization is under investigation by the FBI for what appears to be its receipt of Russian money on behalf of the Trump campaign, which is illegal under federal law. “Even the FBI is not free of its own corruption and its own unethical agents,” the National Rifle Association’s executive vice president, Wayne LaPierre, said in a speech from the main stage .., hinting at alleged anti-Donald Trump bias among agency leaders during the 2016 election and the Russia investigation. “I can understand a few bad apples in organizations as large as the FBI,” he said, “but what’s hard to understand is why no one at the FBI stood up and called BS on its rogue leadership. Corruption and rogue leadership? This from the guy who famously called federal agents “jack-booted thugs” in 1995, which caused NRA Life Member George H.W. Bush to resign from the association that is now under investigation for its rumored ties with jack-booted Kremlin types, friends of former KGB Lieutenant Colonel Vladimir Putin. 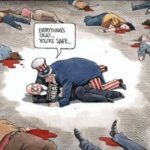 The evolution of the NRA from an organization that was mainstream in its approach to representing its core membership is parallel to the evolution of the Republican Party, where there was an understanding of the need for and trust in public programs (public education, parks, Social Security, Medicare, and Medicaid), a strong military, and those institutions (FBI, CIA and other national security agencies) that keep us safe. 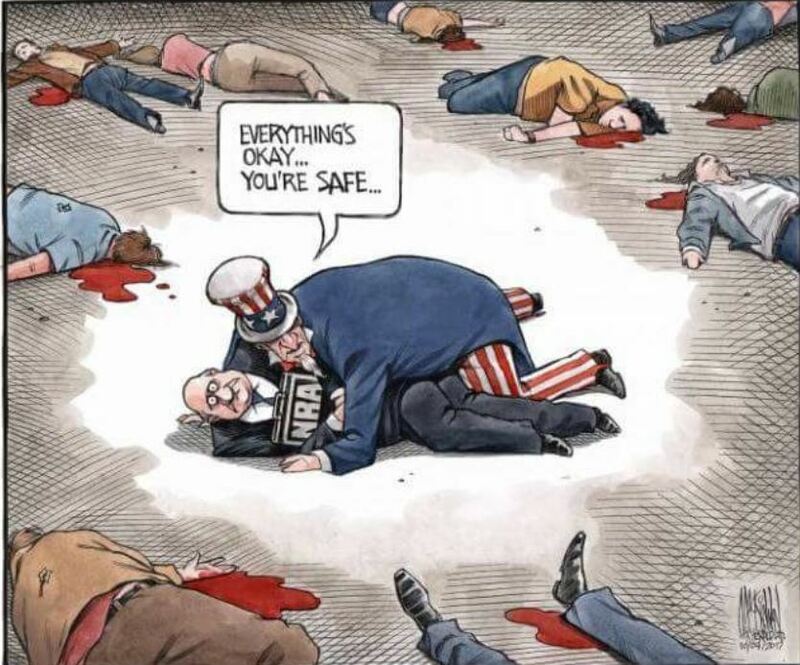 That evolution today is evident in the new NRA, an agent not of the rank-and-file but of the gun manufacturers, and also of a Republican Party that has trashed about every government institution and function – except the military. “Not so long ago, Republican leaders prided themselves on protecting middle-American minds from the liberal intellectual rot being spread by politicians and college professors they viewed as being hostile to law enforcement, contemptuous of constitutional traditions, indifferent to personal morality and accommodating to Russian tyrants. They claimed to be the intellectual heirs of Edmund Burke, Russell Kirk and William F. Buckley Jr. Now those same politicians debase themselves daily in service to Trump. “The FBI is investigating whether a top Russian banker with ties to the Kremlin illegally funneled money to the National Rifle Association to help Donald Trump win the presidency, two sources familiar with the matter have told McClatchy. Sadly, that observation has been confirmed, and Special Counsel Robert Mueller was appointed to investigate Russian collusion with Trump and the 2016 GOP campaign nearly a year after those words were written. What we could not imagine back then, however, is the apparent involvement of the NRA with shady Russian figures skilled at money laundering and adept in navigating the world of organized crime. Which gets us back to the GOP. No, it’s not your father’s Republican Party anymore. The party of family values, fiscal responsibility, and local control has become the agent of discord and disunion, the 21st-century version of a fifth column destabilizing the very foundations of the Republic – a scenario Hoover thought about during his tenure, as he tracked domestic subversives as well as Soviet moles. So if the American people are slowly catching on to the compromised nature of a political party and how it appears to be controlled by the NRA, a major donor to the last campaign, and perhaps compromised by some mysterious Russian ties, what do we do about it? “The Republican Party, as an institution, has become a danger to the rule of law and the integrity of our democracy… In a two-party system, nonpartisanship works only if both parties are consistent democratic actors. If one of them is not predictably so, the space for nonpartisans evaporates. We’re thus driven to believe that the best hope of defending the country from Trump’s Republican enablers, and of saving the Republican Party from itself, is to … vote mindlessly and mechanically against Republicans at every opportunity, until the party either rights itself or implodes (very preferably the former). J. Edgar Hoover’s “Masters of Deceit” details the objective of the Kremlin to subvert our democratic system by its American affiliate. 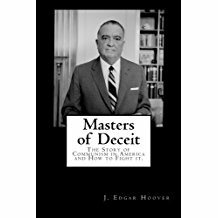 The final irony in the evolution of the Republican Party, now the sanctuary for extremist organizations like the NRA and far-right groups whose positions corrode our democratic system, is found in the title of a book, Masters of Deceit, written by none other than J. Edgar Hoover. Mr. Hoover gave a signed copy of Masters of Deceit to my brother at the time of his induction as an FBI agent. The book details the objective of the Kremlin to subvert our democratic system by its American affiliate. “A disciplined Party of hard-core fanatical members is now at work, along with fellow-travelers, sympathizers, opportunists, and dupes,” Hoover wrote. Sixty years after the publication of Hoover’s book, we indeed are seeing masters of deceit at work, where agents of an American political party met frequently with individuals closely linked to the Kremlin and KGB alumnus Vladimir Putin. Those agents used materials stolen by the Russians from a rival American political party to help the Republicans undermine our democratic process. On top of that, there are indications that Russian money received by the NRA might have been laundered and used by the pro-gun organization to inflict a deadly wound on the Democratic presidential candidate who was anathema to Putin as a result of her tenure as Secretary of State. Even John LaCarre and the imaginative writers of the espionage series, Homeland and The Americans, could not come up with such a plot line. Yes, Hoover used to muse a lot about plots – communist plots. Of these investigative tracks, J. Edgar Hoover would find the last as the most troubling. The party of Dwight Eisenhower and Ronald Reagan, indeed of J. Edgar Hoover, is no more. With its NRA subsidiary (some would say it’s the other way around), the Grand Old Party does seem to be complicit in obstruction of justice. Think of Devin Nunes with his memo that trashed Hoover’s FBI, and Senators Lindsey Graham and Chuck Grassley with their criminal referral filed against former MI 6 officer Christopher Steele. Think about former GOP Campaign Chairman Paul Manafort and former National Security Adviser Michael Flynn, with their extensive Russian ties. Think about Republican California Congressman Dana Rohrabacher, whose own party is concerned about his close Kremlin ties. And then there is Trump, whose eponymous Manhattan headquarters building has been the home of many Russian tenants over the years. We are seeing attempts by numerous Republicans in Congress as well as Trump’s White House operation to obstruct the ongoing Russia investigation. What to do? Even though you haven’t lost your keys, are you confused by all of these developments? It is left for others to determine the accuracy of that tale. But for us, we may want to substitute “Republican Party” in place of “village” to affirm what Rauch and Wittes believe needs to be done in order to cleanse our democracy and restore it to health. If as a result of the sabotage done by Nunes, Grassley, Graham, Trump et. al. to the FBI, Justice Department and other agencies that we aren’t able to tell the good guys from the bad guys anymore, it’s time to bury this rotting hulk called the Republican Party and start over. We all can help the party reform itself by voting out every GOP officeholder that is up for election in 2018. That will send them a clear message: Republicans, clean up your act. It’s time to start over! So let’s lend the Grand Old Party a helping hand. Make sure you show up in November to join the rehab effort so that the Republican Party “either rights itself or implodes (very preferably the former).” Sadly, that is the best alternative to ensure the future viability of our democracy and as a free, independent nation.